The dynamic population and economic development that has been predicted for the urban agglomeration area around Graz (490,000 inhabitants by 2050) poses major societal challenges in terms of resource use, waste management infrastructure, mobility and affordable housing. 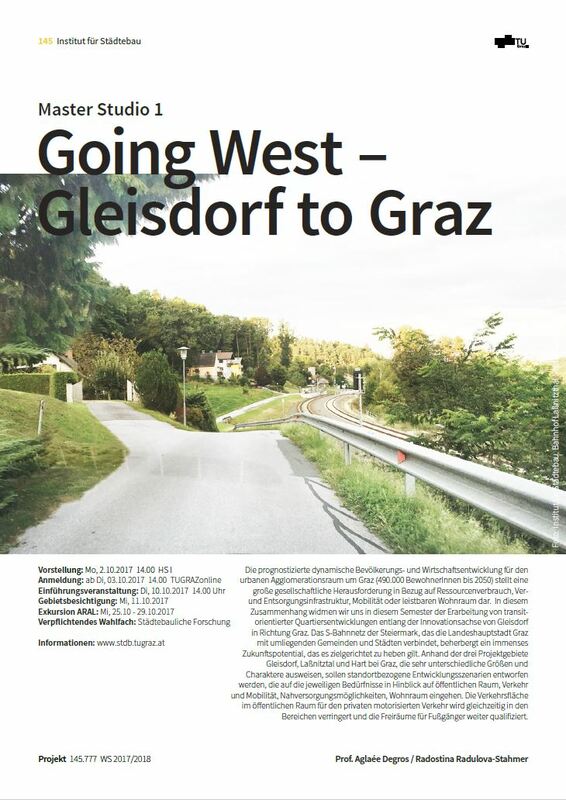 In this context this semester, we will concentrate on the developments related to transit that are taking place in neighbourhoods in the “innovation corridor” that extends from Gleisdorf to Graz. 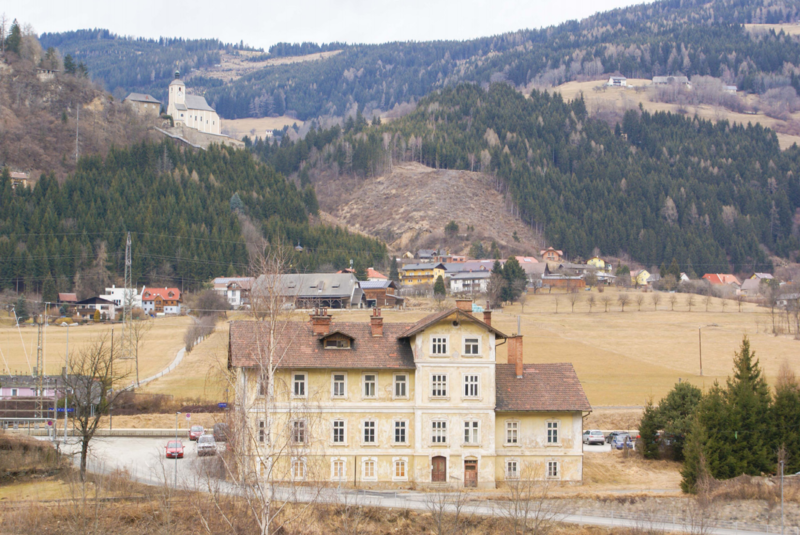 The Styrian S-Bahn network that connects the provincial capital of Graz with surrounding municipalities and cities has an enormous future potential that should be targeted. Site-specific development scenarios will be designed for the three project areas of Gleisdorf, Laßnitzthal and Hart bei Graz – each of which have radically different sizes and qualities – that address their respective needs in terms of public space, transportation and mobility, local supply options and housing. The traffic area in public space that is used for private motorized vehicles will be simultaneously reduced in these areas, and the open spaces that are accessible to pedestrians will be additionally characterised. The forecast for Graz indicates a trend of continual population growth, which represents a major challenge for housing policymakers. In addition to providing housing as part of a sustainable urban development concept, additional space for residential facilities, supply and waste management infrastructure and suitable – and, if possible, environmentally-friendly – mobility provisions must be made. The area around the center of Straßgang is a typical example of a suburban neighbourhood that has a highly heterogenous transportation infrastructure, fragmented housing structure and mediocre appearance. The existing GKB stop (S-Bahn 7 or 61, which connects the area both with the region and the city center) is difficult to reach from the surrounding residential areas, but surrounded by extensive areas of potentially-available land. In the project exercise, development scenarios should be developed to increase the densification in the area, generally support the principle of favouring short distances within the city and, in particular, demonstrate transit-oriented development (TOD) and define proposals to improve the existing or create new, high-quality public space. This semester, we will examine the design concept of a dance theatre to be created for the Tanzakademie Ljubljana [Dance Academy Ljubljana]. The spaces to be used for the dance production, reception and education will be complemented with freely- and publicly-accessible areas to create a space that fits into the complex artistic and cultural landscape of the city. In addition to addressing the question of the typology of a (dance) theatre that has undergone constant modification and alteration throughout its history, we will explore the city of Ljubljana itself and its urban and architectural characteristics, which are strongly influenced by the work of the Slovenian architect Jože Pležnik, as we approach this task. The relationship between architecture and landscape or, more precisely, the relationship between winery architecture and culture – as well as the wine production landscape – are the central themes of this design project, which deals with the karst landscape of the Trieste backcountry. In a workshop held in this area, a residential area on the border with Slovenia, we will examine village and building structures related to agricultural production, which are undergoing radical changes. New methods and even new technologies used in winemaking are changing despite the small, highly-specific topography, wine country and architecture. Perhaps a winery, but in any case, the transformation of a wine production area in Carso Triestino, will be the theme of the design project. Island Systems and Archipelagos – entire nations like Kiribati or Tuvalu – are facing their extinction by permanent flooding due to the sea level rise. At the same time major garbage patches out of plastic waste already form islands, whose surface areas are today bigger than France. Furthermore, the Pacific Ocean is shaped and surrounded by a ring of geological plate boundaries and vulcanoes, that regularly led to earthquakes and tsunamis. At the cliffs of San Francisco Bay with a very sensitive ecosystem – this Studio will focus on the contextual design of a Research and Information Center for this vast maritime ecosystem. The context driven integral projects of student teams will participate in the international student competition “Architecture at Zero”. Architecture at Zero means for us, to set the count to Zero - everything is negotiable! Building in the bay does not only mean to embed a structure in the ecosystem, rather it will become a part of it. The new maritime center will act as an interface, connecting the findings of researcher with the experiences of the visitors to an integral whole. The approach of Integral Design also implies essential requirements; to design a self sustaining system with zero energy consumption and to replace all plastics with renewable materials. The goal of the project exercise is to develop and design spatial typologies with special qualities that allow the coexistence of people with different ethnicities and ages, who belong to different community groups, in Unzmarkt-Frauenburg. In this context, residing is neither defined as an end in and of itself nor merely an achievement of consumption in the sense of Classical Moderism and pure functionalism/Fordism, but instead interpreted, considered and shaped as integral to productive activity. The negative aspects and consequences of functional segregation (division of labour, etc.) are increasingly evident, especially in rural areas that have been affected by large migration... on the other hand, the increasing isolation of people (due to teleworking, telebanking, teleshopping, etc. ), whereby they retreat to their own living rooms and only find contact with others via their PC / Apple, must be considered. We will design and build a full scale wood structure at the Alte Technik campus by means of a combination of robotic and manual craft. The approach is based on the integration of fabrication strategies in the design thinking process and relies on hands-on experimentation and the holistic understanding of aesthetics, structure and tectonics. 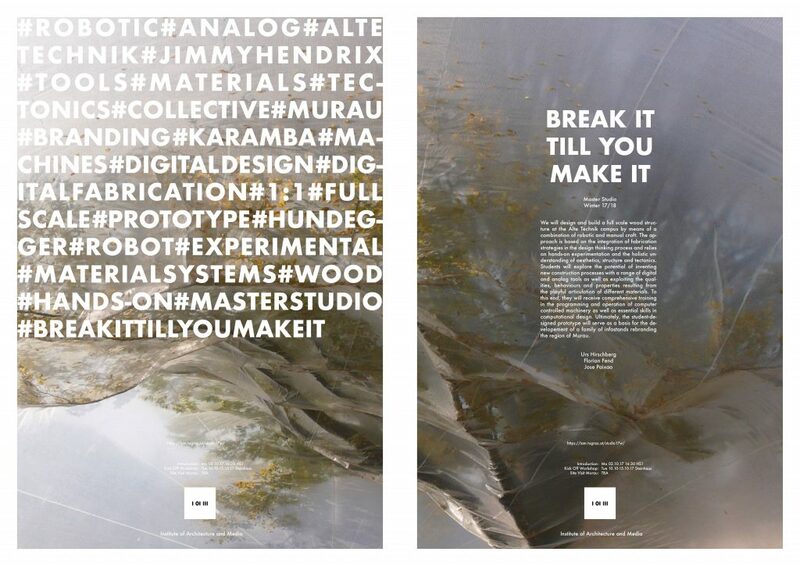 Students will explore the potential of inventing new construction processes with a range of digital and analog tools as well as exploiting the qualities, behaviors and properties resulting from the playful articulation of different materials. To this end, they will receive comprehensive training in the programming and operation of computer controlled machinery as well as essential skills in computational design. Ultimately, the student-designed prototype will serve as a basis for the development of a family of infostands rebranding the region of Murau.